So my little talk Tuesday night went well. A great crowd of science savvy people showed up including at least one biology lecturer and biology teacher and a variety of others. I was pleased with things and all of the feedback has been very positive which is always nice. Much as stuff online is good as it can be archived and reach huge numbers of people, talks can be so much more engaging and interactive and really enthuse people so I do like doing them too.Having such an audience is great as the questions can be really quite in depth and insightful, and of course you can often pitch your answers a little higher than when dealing with kids or a more general audience. 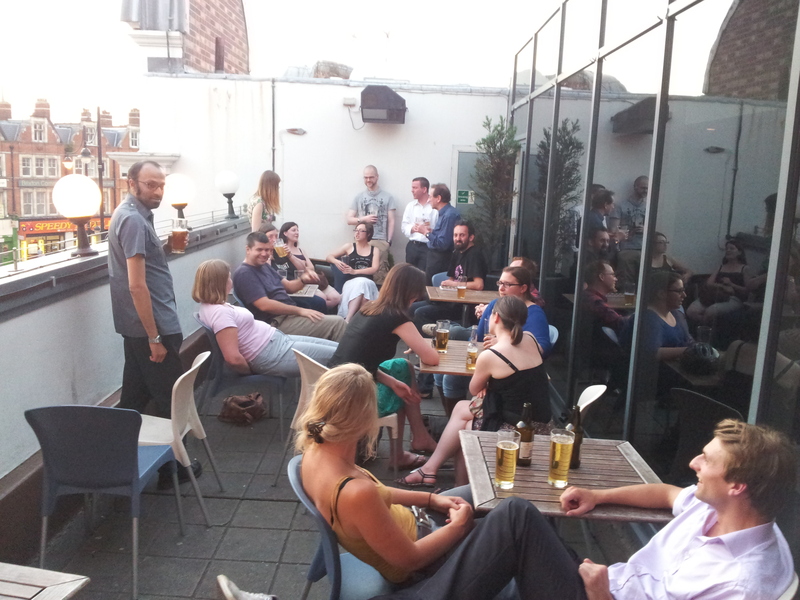 The weather was sweltering so after the talk, we retired to the evening sunshine on the balcony for the Q&A as seen below. In this case, I was also collared by the PodDelusion crew afterwards for an impromptu interview for their next episode. 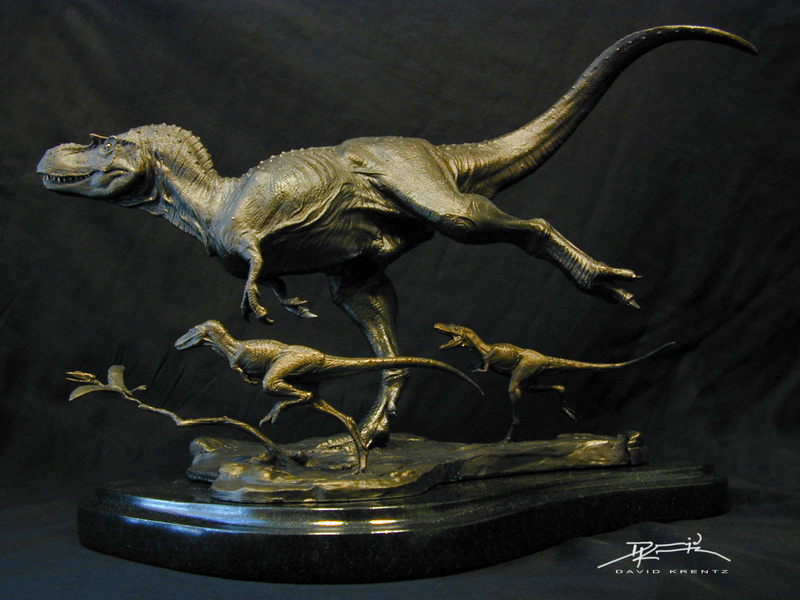 That has just gone up online here if you want to hear me rambling a little about dinosaurs. One of the questions they asked was about my most recent Guardian piece on persistent dinosaur myths so this blog post bringing things almost full circle with a blog entry, podcast, public lecture and mainstream media bit. Phew! 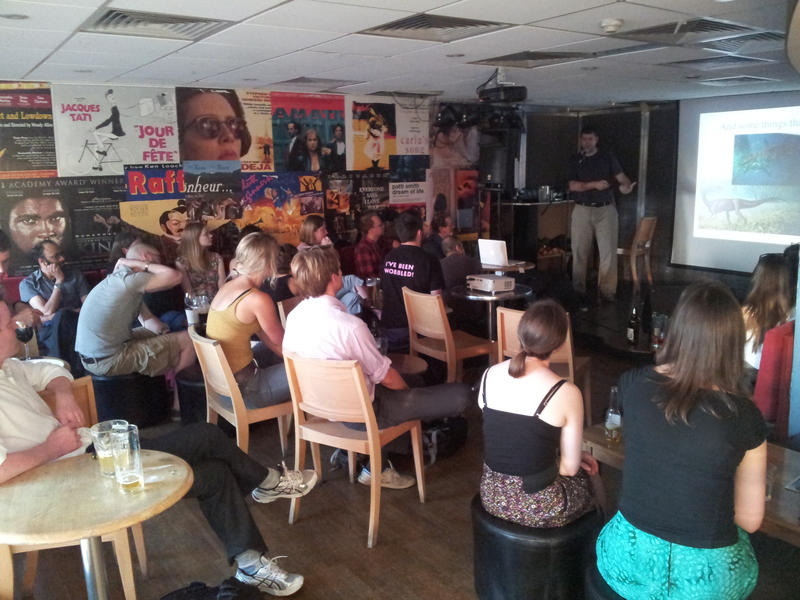 My thanks to Paolo Viscardi for the invitation to this PubSci piece, great fun was had by all (well, I didn’t get heckled). Specialist in the evolutionary biomechanics of terrestrial locomotion, with a particular focus on body size influences on posture and movement. I was passionate about reptiles from an early age; “dockadile” was one of my first words; so of course dinosaurs became a natural fixation, and I went through the usual palaeontologist cycle of forgetting about dinosaurs during puberty then falling back in love with them in college. What kickstarted my more intellectual love affair with dinosaurs in college was reading and later watching Jurassic Park, taking a bunch of classes in evolution and later palaeontology, and reading Greg Paul’s “Predatory Dinosaurs of the World” book in my final undergrad year, while working as a volunteer at the University of Wisconsin Geological Museum (helping w/nice mosasaur fossils). 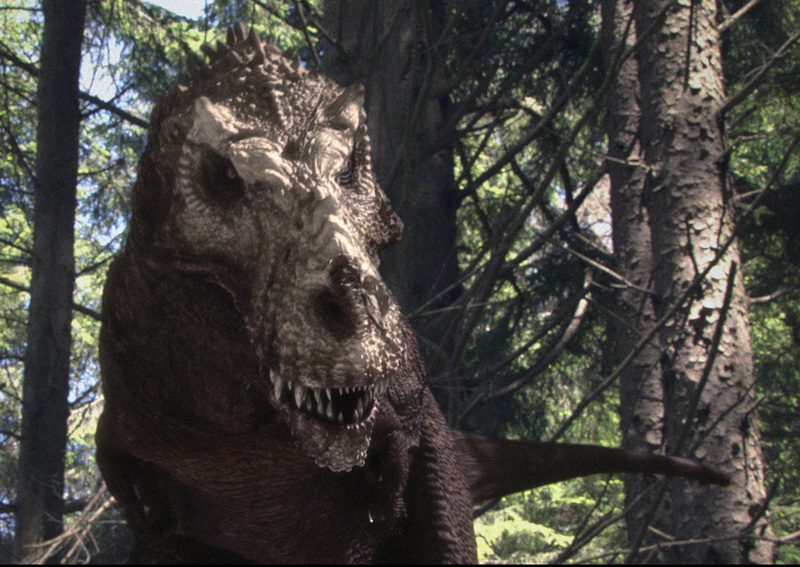 The vivid animations in Jurassic Park (the movie) and Paul’s book, along with a class I’d taken on functional morphology/biomechanics, got me really interested in dinosaur locomotion, and that led soon enough into my PhD at Berkeley. The rest is history (infamy?). From my own work, I think my favourite paper is the paper that I recently published in Science on the evolution of false sixth toes (predigits) in elephants. We integrated data from dissections, imaging, histology, fossils, biomechanics and phylogeny in a way none of my prior studies had really achieved and went in a direction that was a novel step for my research, enabled by a great collaborative team. That was an incredibly fun project and came out of left field from just dabbling around with research, as I like to do, until I stumbled across a neat story. Yet I still have a fondness for my “Tyrannosaurus was not a fast runner” 2003 Nature paper, which more or less established my career and happened during a very challenging year in my life. That paper was basically what I set off to do when I started by PhD in 1995, so it was very satisfying to see the final payoff (and actually end up doing the same PhD project I originally aimed to do, which is uncommon in the USA). My field encompasses both neontological and palaeontological research; I think the boundaries between these disciplines are very limiting for both; so the discoveries I value the most are those that transcend these traditional boundaries. 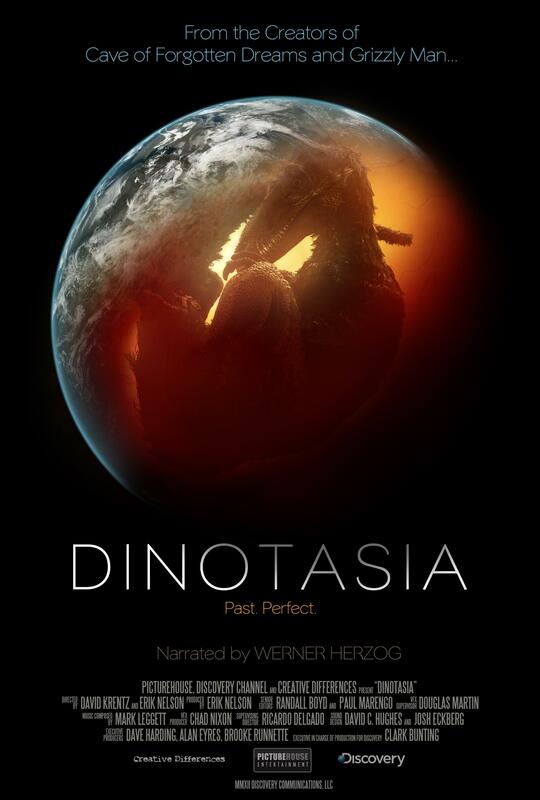 It is hard to put a finger on just one favourite but off the cuff, I think the work that Larry Witmer’s team has done on reconstructing cranial anatomy in dinosaurs is the most important multidisciplinary work of our time – it shows how far you can get with good anatomy, and how rigorous the science can still be when reconstructing soft tissues. In a way, I’d put that ahead of the feather discoveries. In my related field of biomechanics, the way that dynamic models of the musculoskeletal system have matured into very rigorous computational tools is incredibly exciting and beginning to have massive payoffs that are bound to continue well beyond our lifetimes. I’ll be potentially controversial and say that dinosaur locomotion is almost worked out as far as we can get. The rest is just details. For now, anyway. I say “for now” because now we’re up against a fundamental lack of understanding of how living animals work, which impedes how far we can get with reconstructing extinct animals, leaving a serious danger of constructing a lot of houses-of-cards in this area. That is why I urge palaeontology-type researchers I work with to contribute both to our understanding of living animals, for their own sake, as well as to our inferences about extinct animals. For palaeontology to proceed much further, we need to push neontology forward, and unite these disciplines more strongly. I’m profoundly tired of “us vs. them” arguments in both fields, such as molecules “vs” morphology; the latter is an analogous example of how people waste time defending their disciplinary territory. There’s just one life science; one history of life on Earth; get over it and work together where necessary to find the one answer. Similarly, in biomechanics there’s a lot of guff about theoretical “vs” experimental methods and which is better science. The focus on questions often gets forgotten. So, unity is what I’m preaching, because it will lead to questions getting answered. -Don’t trust your supervisor; after a year or so of your research you probably know more than them. Challenge their authority, objectively. -Read the crappy science as well as the good science. It makes you a better critical thinker. -Push yourself to be a questions-researcher, not just a methods-producer (or worse yet, just a user). Methods are ephemeral; answers can be eternal (if you’re lucky). -Know your limits; that’s what a young researcher is probing. Reach out to work with others that complement your skills, rather than try to do everything yourself. -Push yourself to value scientific and professional integrity. I’m no saint either, but people do get known for being honest and fair in their scientific and professional lives. -“Work-life balance” is nonsense. Practice work-life integration; boundaries can be fluid. Science is about an all-consuming passion for the natural world; it shouldn’t be contained within 9-5 working hours or it gets stale. Nor should it prevent you from having fun, including taking breaks to “refuel” when your Science-Fu levels are low. In these days of a terrible job market, the competition is insanely tough so you need to work efficiently and prioritize what is best for your career (which may be best for your life in a broader sense). -Be incredibly ambitious, but with full recognition that your “5-year plan” will last your whole career, and everything in science takes immensely more time than almost anyone thinks it will. Just a reminder to those who may have missed it or forgotten, tonight in Brixton I’ll be talking about my research on theropod dinosaurs and their feeding and hunting habits. Drop in to hear me, or to talk dinosaurs before or afterwards. I had a nice weekend in ‘the field’ one way and another. Saturday was spent with a team from Portsmouth doing a little prospecting and mapping of a quarry in Oxfordshire. It’s an SSSI and a place that has been subject to illegal digging in the past so I won’t be saying exactly where we were, but it’s Middle Jurassic in age and known to have produced dinosaur material. Indeed it continues to produce dinosaur material as I found the above element within about 5 minutes of arriving, though sadly that was it. 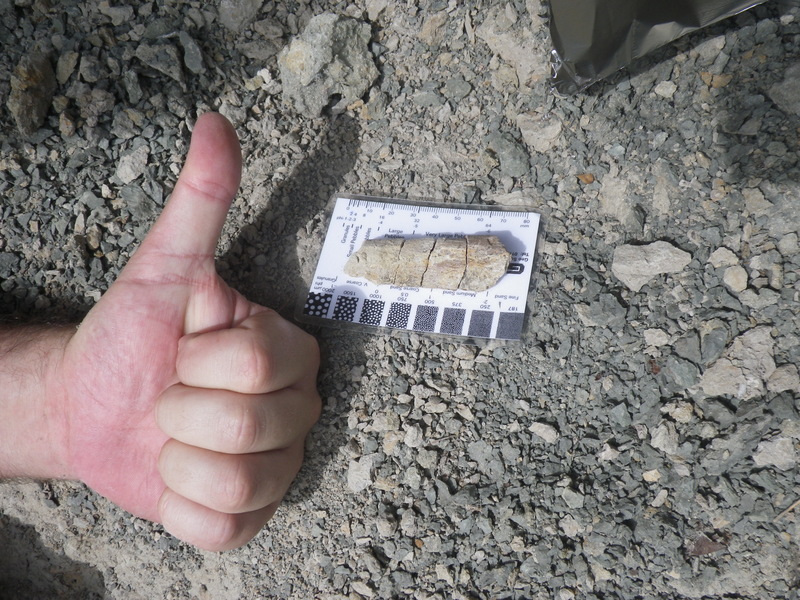 We did find some isolated (non-dinosaurian) teeth as well and some samples have gone back to the lab for processing and to look for microfossils, so more interesting bits may yet turn up. Sunday was spent down on Thursley heath in the south of the UK, with a friend. It’s a great place to spot various dragon and damselflies and they were out in droves. We saw probably a dozen or more species in just a couple of hours including mating pairs, those hunting and one that while emerged and flying, still had the emargo case still stuck onto it. 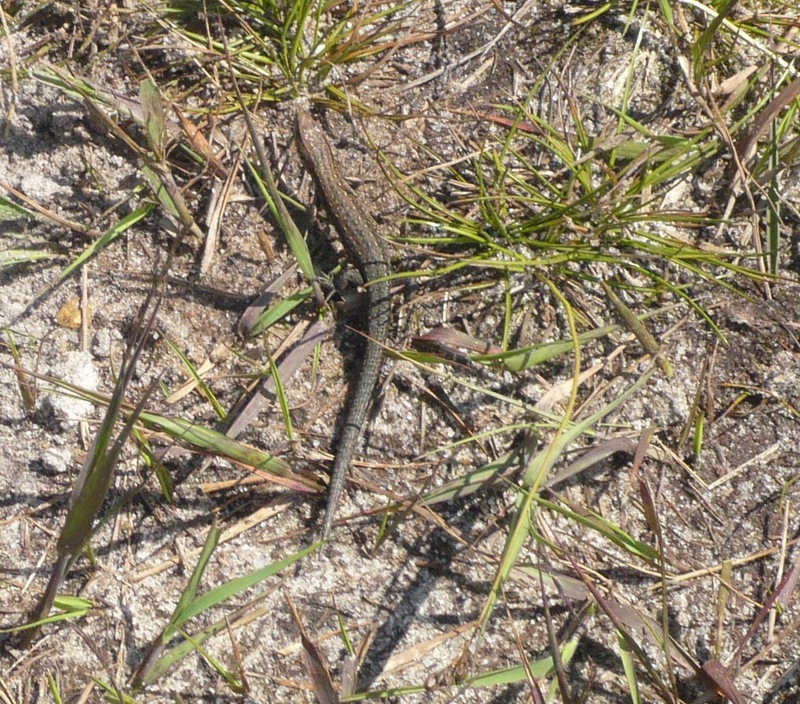 The combination of sandy heat and acidic bogs means you get a odd mix of wildlife – there’s not too many birds and no amphibians, but tons of insects and a good number of reptiles. Last time out here there were an absolute ton of lizards and a very large grass snake, this time I was lucky enough to see my first adder – the U.K.’s only poisonous snake and an animal that’s far from common. It was suggested to me not too long ago that I might well have the best and most extensive collection of images of Archaeopteryx specimens online. Between having seen quite a few of these on display and having taken photos myself, plus the near endless collection generously sent on by Helmut Tischlinger of his UV works, nearly every specimen is on here and most with multiple views, close-ups and in UV. I am still missing a couple, but I’d have to agree that I’ve yet to see any online collection that can rival mine. Still, they are scatted around all manner of posts and so aren’t necessarily that easy to find. No more, here’s they are all are for convenience. If you have others you are happy to share and have permission to distribute, do please let me know and send them on. This is simply there as a reference collection for people to learn and work with, but obviously more (or better, not all of these are great) would be lovely to have and make this still more useful. I know there are some scans and images out there and it’d be great to round this out as a clearing-house for people who want to see and compare these specimens. So after the comments both on here and over at Luis’ new blog, Luis has sorted out the trimmed branches problem with a new tree trunk. The result is above. As a ‘bonus’ here’s my original sketch of the critter that I sent to Luis. I’m no artist and it was done quickly, but hopefully conveyed the essence of what I had in my mind. 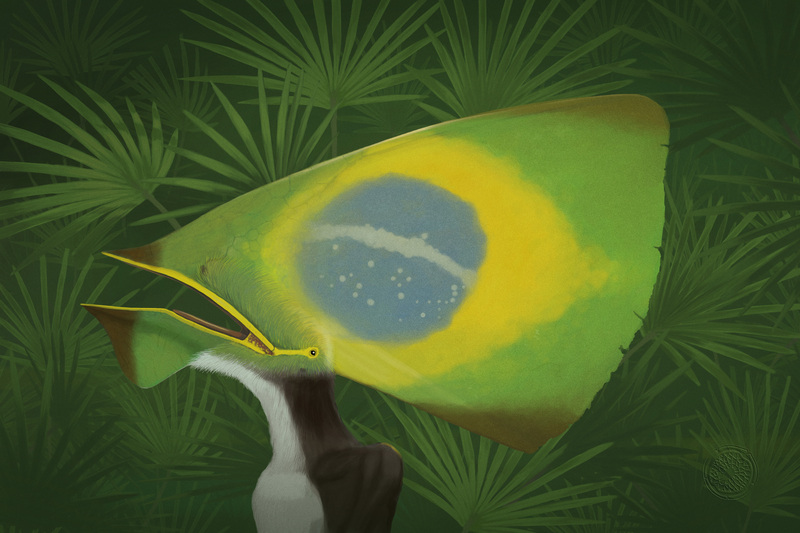 The psychedelic colours were not a guide for Luis, but to try and make it clear which parts of which wing membranes went where – if just black and white, it was rather a mess and things were a bit confused. 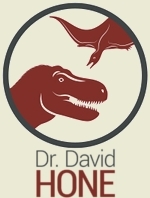 Specialist in predatory dinosaur evolution, dinosaur functional morphology, and the dinosaur fossil record. 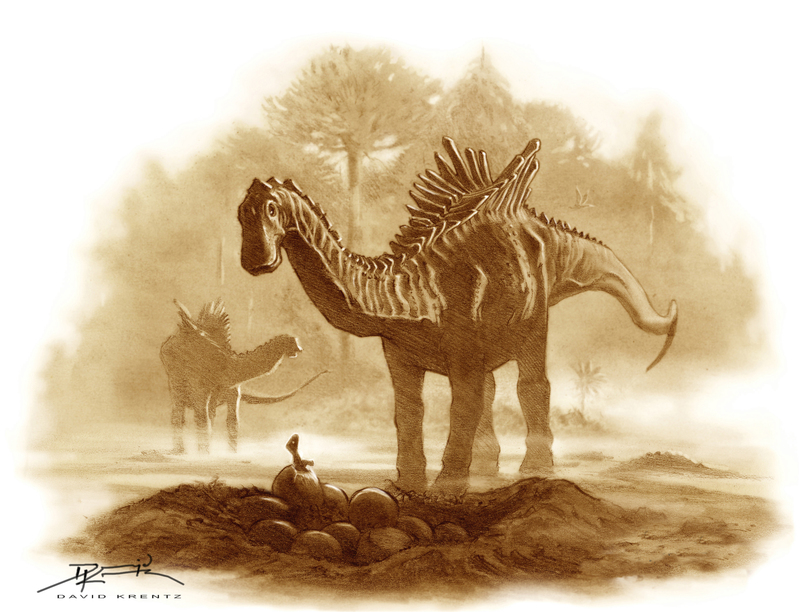 I first got interested in dinosaurs in the second grade, after reading the (1970s version) National Geographic Book, “Dinosaurs,” with its wonderful illustrations by Jay Matternes. 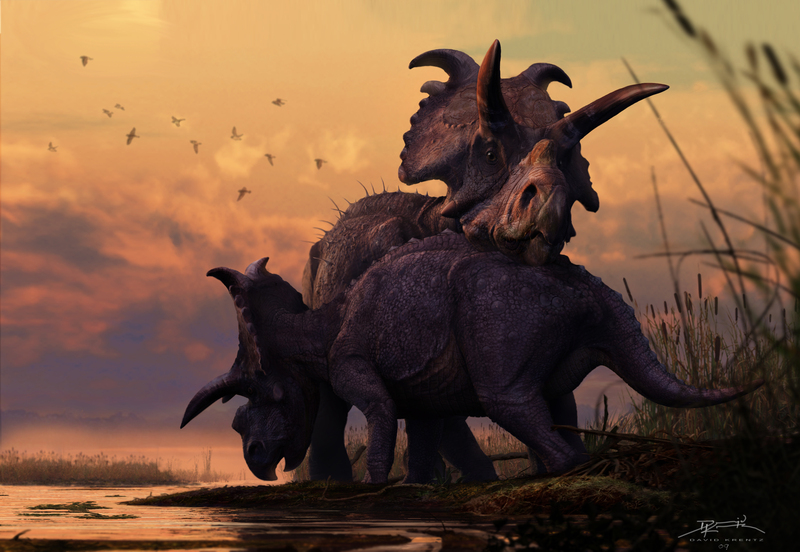 Dinosaurs and paleontology became a lifelong interest after that, through college and into graduate school. My research interests developed in college at Brown University, working with my advisor Christine Janis (functional morphology), and in graduate school at the University of Chicago, working with a large cohort of fellow students with enormously wide interests of their own. 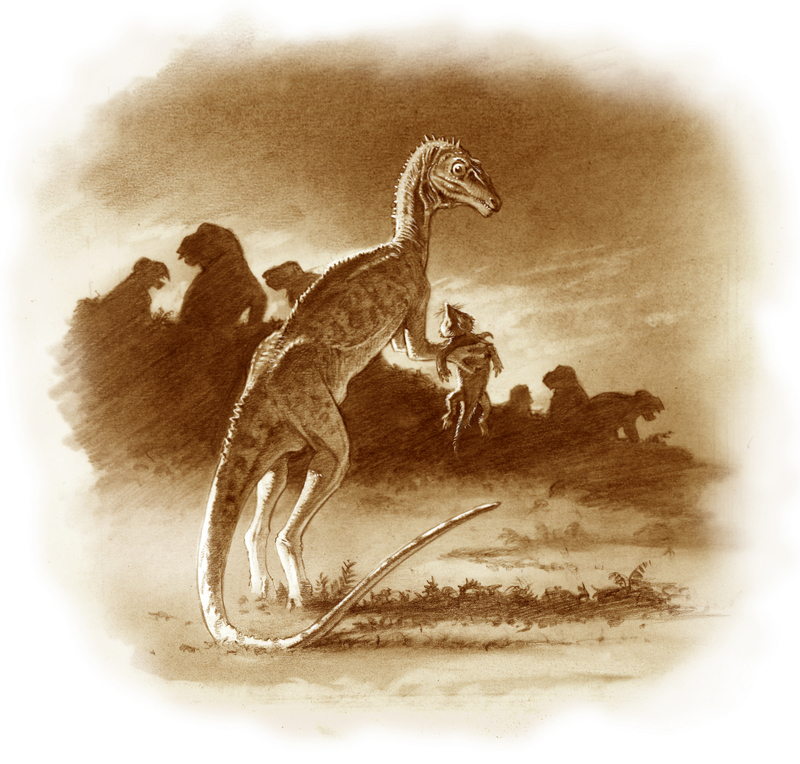 I think my favorite piece of research is still a study I did as part of my dissertation work, where I found that dinosaurs and mammals had almost identically proportioned limbs, quite unlike birds or other reptiles. I did some experimental work that allowed me to suggest that dinosaurs and mammals may therefore have had very broadly similar locomotor styles. I remember the “aha!” moment when it all came together for me, and it was quite gratifying to hear people in the audience say the same thing when I delivered a talk on it at SVP in 1997. 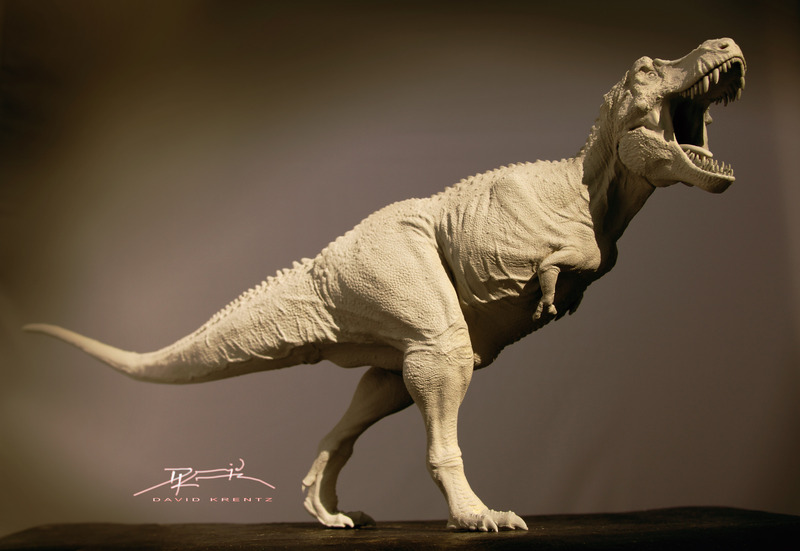 I think that the most important general development in dinosaur paleontology has been the increasing interest in trying to use the dinosaur fossil record to answer questions of broader paleontological interest. It’s not always successful, and many times we overreach, but I think it’s been a very healthy development in the field and a real change in direction. More specifically, in my own areas of research, I think the most important new discoveries in recent years are all the new taxa from new areas of the world (such as Concavenator in Spain or Ichthyovenator in Laos). These have provided important new data for both evolutionary studies and filled in big temporal and geographic gaps in the fossil record. I think the biggest unanswered question in my field is exactly how good the dinosaur fossil record really is, and what sorts of scientific questions it can (and cannot) be fruitfully employed toward. We are working hard on this problem, but it is quite difficult and parts of it might be intractable, but the availability of more powerful databases and more people with this research interest give me hope that significant progress is not far away. I’d give a few key pieces of advice to students regarding their research (some of which will no doubt be at odds with advice given by some of my colleagues). First, get used to reading actual research papers, thinking about them thoroughly, and waiting to respond to them. Be careful and thorough, publish your results when they’re ready, and don’t worry about how many papers you have under your belt. The number of papers published annually in paleontology has increased substantially in the last few years, but in my opinion the number of good, lasting, and intellectually robust papers has not. We need more wheat, not more chaff. So onto the last major post about Bellubrunnus – the tail. The tails of rhamphorhychines are interesting as they have a somewhat unusual anatomy. Just like the dromaeosaurs (though obviously, convergently acquired) rhamphorhynchines have elongate zygopophyses and chevrons that overlap multiple vertebrae and bind the tail together so that it is a relatively stiffened structure. These extensions are basically rods of bone, and can long enough to overlap the four or five adjacent vertebrae to their origin. However, Bellubrunnus appears to be unique among rhamphorhynchines in lacking these structures. 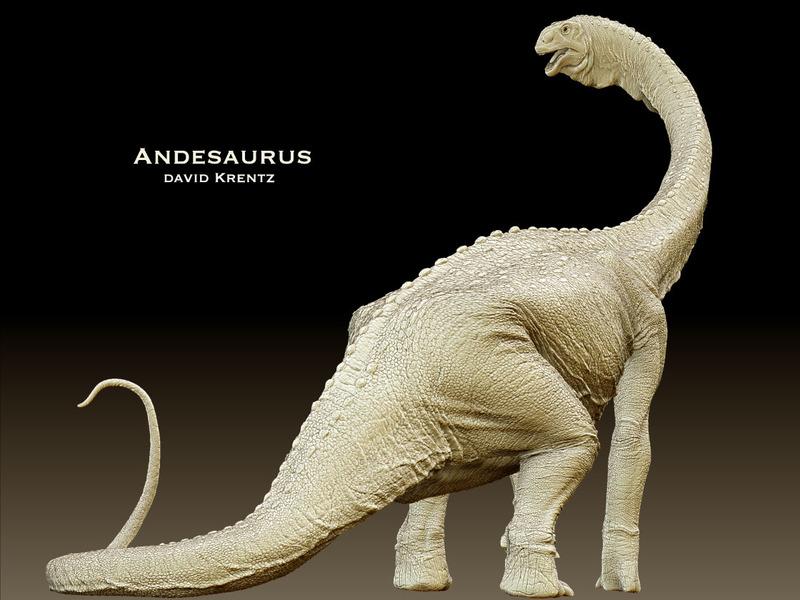 It still has zygopophyses and chevrons (as can be just about seen in the figure) and compared to some pterosaurs at least these are long, but they are a fraction of the length of other closely related species. This begs the obvious question, of what happened – are these really reduced or is there some other factor at play? Well, there are a number of possible hypotheses to explain this and here I’ll go through them and why we have come to the conclusion that this is a genuine feature. Not all of the chevrons are there for sure, so some have been lost or remain cryptic for whatever reason, but several are quite well preserved and so the below discussions refer to the issue of the size and shape rather than presence / absence of chevrons. First off, were these simply not properly ossified prior to preservation and were there, just as unpreserved cartilage? This seems really unlikely, even the smallest and youngest specimens of Rhamphorhycnhus (which includes specimens even smaller than Bellubrunnus) have fully ossified chevrons and zygopophyses. These seem to be present at a very early age in the pterosaurs that have them and so it would be odd if they had a different ossification pattern here. Indeed it would be doubly odd since if anything, Bellubrunnus has better ossification of its elements than is usual for small pterosaurs, with well-preserved and ossified tarsals and sternum. So it is far more likely that they are fully ossified, they are just much smaller. Could these have been lost through decomposition or disassociation from the specimen, or may not have been preserved even if they were ossified? While a few pieces have begun to disarticulate and move (the gastralia and a few dorsal centra and the prepubes) nothing else on the specimen has really begun to move and indeed the caudal vertebrae as a whole is well articulated. It would be odd indeed if the only thing to have rotted or moved was the chevrons or parts of them, while the rest remained intact and complete. 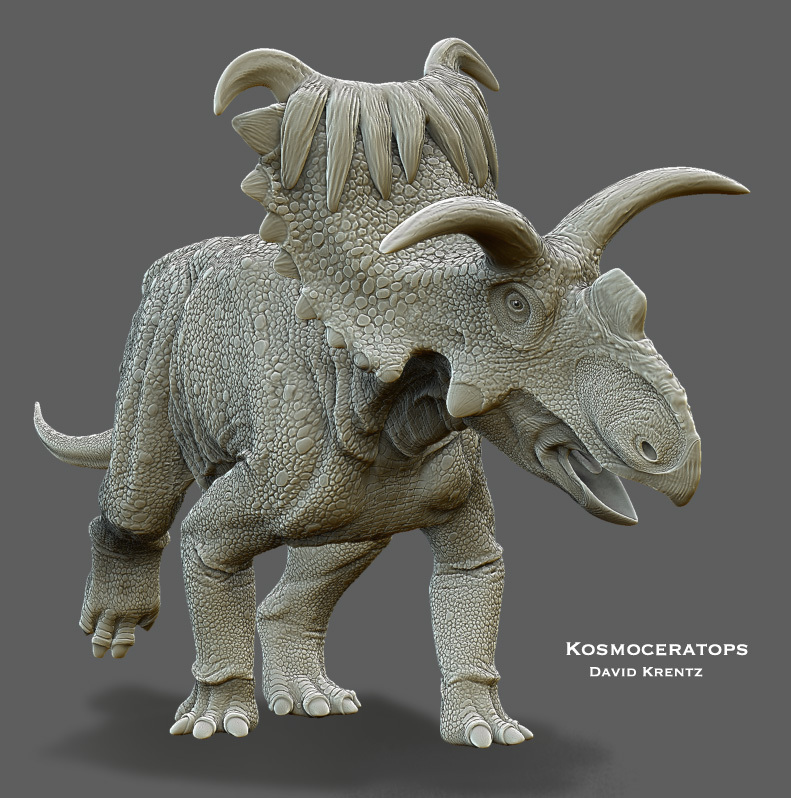 Similarly, with even tiny parts like the delicate palate and gastralia being preserved (and indeed at least a couple of chevrons) it also seems unlikely that these somehow resisted preservation when everything else is there. Certainly it’s possible, but even so, some are still there and the loss of many chevrons would not affect the shape of the ones that have survived and wouldn’t affect the zygopophyses. Were these destroyed or modified through preparation? This is a tricky one to answer, but again, there’s no obvious reason to think so. The preparation job is superb (look at the skull!) and was done with great care and attention to detail. It’s always possible that thin and delicate structures were lost, but while the matrix has been all but scraped clean, at least some have survived (and again lots of other delicate things) and I find it hard to imagine they were modified in such a consistent manner. Are these genuinely distinct then? That is the obvious conclusion given the problems with the other hypotheses. However, there is more than just negative arguments against these other ideas, but there are reasons to positively support the idea that these are genuinely short. Although greatly reduced in length, the anatomy of both the zygopophyses and chevrons is otherwise well consistent with the anatomy of these features in other rhamphorhychines. The zygopophyses are rather rod-like and then taper abruptly to a point, just as we see in others, only with a much shorter rod. And similarly the chevrons are long and thin and splint-like, terminating in a point at each end, just as we see in others, only again being rather shorter. While as noted we are rather short of chevrons for whatever reason, those that remain and indeed the zygopophyses seem to have a genuinely distinct morphology to other rhamphorhynchines, including similarly small and young specimens of Rhamphorhycnhus. This then is a major anatomical difference that separates Bellubrunnus from its nearest relatives as well as providing a little more interest and intrigue in the origins of this structure since while it is present on all other rhamphorhycnhines, it’s also present in basal pterosaurs outside the group and so may well have had multiple origins and losses. At the end of my last post I raised a most significant point – Bellubrunnus isn’t a Solnhofen pterosaur. While it’s easy to think that those Jurassic lithographic beds from Bavaria are the Solnhofen, it’s not the case. Like all rock records, different divisions are known and are grouped in various hierarchical clusters. The Solnhofen is home to a lot of important species (Archaeopteryx for starters, not to mention all the pterosaurs and insects and plants and fishes) and a good deal of work has gone into working out the stratigraphy of all these different fossil-bearing beads, but not all lithographic limestones lie in the Solnhofen. Obviously this doesn’t mean that an animal from one layer right above or below the Solnhofen didn’t overlap in time with other strata – the rocks don’t delineate when and where species lived. However, Brunn is rather older than even the oldest Solnhofen beds and from the Kimmeridgian rather than the Tithonian. While the rocks are of a similar kind and were put down in a similar manner in similar ecosystems, the two are different. Work on the Brunn beds are still very new and I must confess I’ve not looked into it in any great detail (not least as all the literature seems to be in German) and have had to rely heavily on my colleagues here. Still, the two do seem to contain different taxa as a whole and while to date the higher vertebrates at Brunn have been few and far between, given the quality of the preservation, I don’t think there’s any reason to expect that we won’t get a lot more in the future. Moreover this does suggest that Brunn is different to the Solnhofen and so we might expect a different (if closely related) fauna to be present. 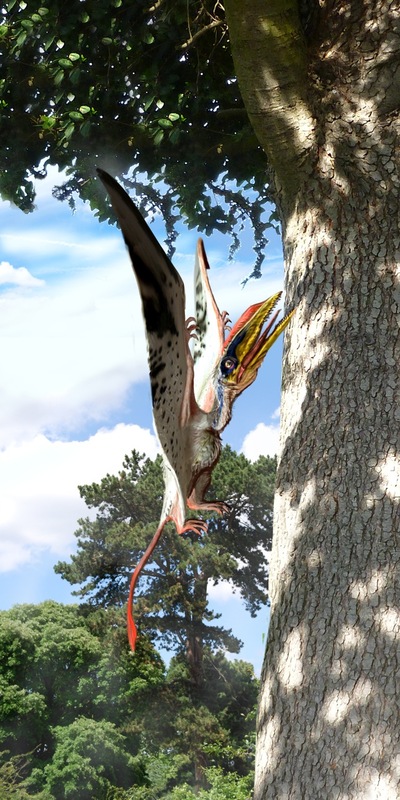 In short, the fact that we now have literally hundreds of pterosaurs from the Solnhofen and no record of Bellubrunnus there, supports the idea that this is a different genus, and also the idea that there might be many more new pterosaur species in there to be found. At the very least, there is a lot more to learn from the Brunn biota. One last point to address here lies in the temporal distribution of rhamphorhycnhines. The recently described Qinlongopterus is also known from a single, small, and young specimen, though it heralds from the Middle Jurassic of China. As described this taxon is really rather similar to Rhamphorhynchus and it was suggested that as such, the rhamphorhycnhines might be really rather stable as a group and went long periods of time with little morphological change. Obviously Bellubrunnus interrupts this apparent trend, as compared to the Middle Jurassic of China, it’s much closer in time and space to Rhamphoprhynchus, yet does have quite a few differences. This is probably due to that fact that unlike Bellubrunnus, Qinlongopterus is really badly preserved, and morphological information is rather limited. What can be seen in Qinlongopterus is very Rhamphorhynchus-like, but that’s not saying much since the condition of it means that not all the many details can be seen. Plus of course the young of species tend to be much harder to tell apart than the adults, since, well they don’t have all their adult features yet and typically the younger they are the harder that will be. So in fact this ‘stability’ is illusory based on the age and condition of Qinlongopterus and in any case is interrupted by the emergence of Bellubrunnus and its differing anatomy.